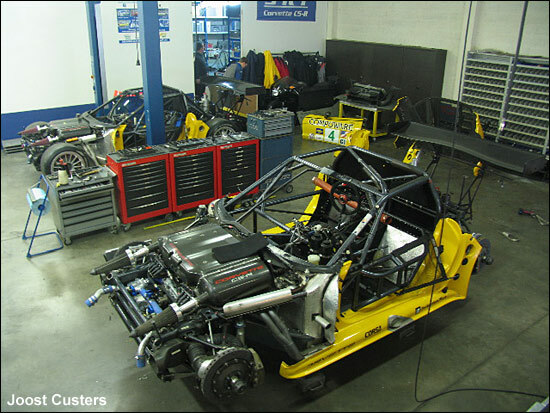 Joost Custers popped into Patrick Selleslagh’s workshop on Friday (March 10), and found both of the team’s Corvette C5-Rs in full, pre-season, preparation mode. It first raced in the May 2002 Sears Point ALMS race, which it won with Fellows and O'Connell. In all, it did 10 races, always with O'Connell and Fellows (and their third drivers in the longer races), winning seven of these races (Sears Point, Mid-Ohio, Washington, Mosport, Miami and PLM in 2002, and Sebring in 2003). Its last race was the Road Atlanta race in June 2003. SRT will typically use this one in the Belcar championship, while the #007 chassis heads to France. “In Belgium, there is also an option to run a second car (chassis #007) for five races. A one race program for the Zolder or Spa 24-hour race is also a possibility. (Funded) candidates may always apply. SRT’s launch is set for Friday March 24, at the Brussels Motor show at the Heyzel Palace. #005 is in the foreground of these photographs. Both cars will race in SRT's familiar blue livery.